RBC Capital Markets‘ quarterly reviews and sector outlooks report is always a meaty recap of what’s gone on over the past three months and what might transpire in the near future. The investment firm’s second-quarter report does not disappoint on those measures. The firm cited Canada’s 0.1 per cent decline in GDP, a deep freeze extending through February in the Northeast, and revenue hits now rolling through the oil patch. GDP growth for the first quarter may come in at an anaemic one per cent, down from rates of 3.2% and 2.4% in the third and fourth quarters, respectively. The report, authored by RBC analyst Neil Downey, sees further downward revisions to 2015 GDP growth possible as Alberta continues to decelerate and forecasts for a rebound in Ontario perhaps too optimistic. The investment firm also laid out its expectation for the strength of the various sectors over one-year, two-year and three-year time frames. For 2015, the sector with the strongest market fundamentals is hotel/lodging; followed by industrial; multi-family; seniors housing; retail, and lastly, office. While there is some shifting year-to-year, RBC expects the retail and office sectors to be the poorest performers over the next three years, with NOI growth of just zero to two per cent and minus-2% to 2% respectively. From the list of 41 TSX-listed REITs, RBC came up with have nine “outperforms” for investors: Allied Properties REIT (AP.UN-T), CAPREIT (CAR.UN-T), CREIT (REF.UN-T), InnVest REIT (INN.UN-T), Milestone Apartments REIT (MST.UN-T) , Morguard North American Residential REIT (MRG.UN-T), Pure Industrial REIT (AAR.UN-T) , RioCan REIT (REI.UN-T) and WPT Industrial REIT (WIR.U-T). While the outlook is uncertain, RBC noted publicly traded real estate was quick out of the gate in 2015, buoyed in part by the Bank of Canada. The S&P/TSX Capped REIT posted a solid first-quarter total return of 8.0 (6.5% price appreciation and 1.5% in yield). The REIT Index’s total return more than doubled that of the broader market, as measured by the 2.6% total return from the S&P/TSX Composite Index and outperformed the 5.6% total return from 10-year Government of Canada bonds. The first-quarter performance was broad-based, with about 85% of listed REITs/REOCs posting positive total returns. TSX-listed REITs ended the quarter with a market cap of approximately $67 billion, up seven per cent from $62 billion at the start of the year. By quarter’s end, 18 REITs had equity market caps in excess of $1 billion (up from 17 at the end of 2014), and 15 REITS had a market cap greater than $2 billion (compared with 13 at the end of 2014). Equity capital raising activity is at a “measured pace” with $670 million of public equity and equity-related capital raised via seven transactions in the first quarter. 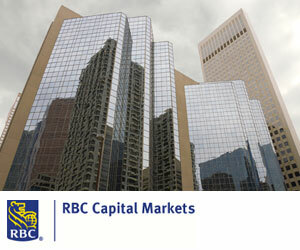 RBC chalks up the less-than-eye-popping equity capital-raising volume on : 1) The overall valuation level of listed real estate; 2) a lack of acquisition opportunities for the large REITs and REOCs; 3) increased capital recycling, predominantly by the larger REITs and REOCs; and 4) favourable real estate debt market conditions. It forecasts financial modesty to continue for the balance of the year with a capital issuance forecast of just $2 billion for 2015. RBC came up with an annual “trend-line” for earnings growth in 2014 that registered four per cent, pretty much in line with long-term historical averages, it said. It expects “remarkable constant” earnings growth in that four per cent range for 2015-16. RBC finds public real estate companies are priced closely to fair value and it projects a 2015 total return range of three to 18 per cent. The story declares Canadian REITs are the cheapest relative to their U.S. peers since the financial crisis: shareholders are paying 13 times a Canadian REIT’s funds from operations to own shares in 51 companies based on Bloomberg data. Shareholders in 210 U.S. REITs meanwhile paid more than 20 times the cash-flow measure at the end of last year. The difference between the two ratios is the widest since 2009.